Start the BREEAM process as early as possible. It makes achieving sustainability targets easier and cheaper than leaving it later. Currently the most prominent sustainability assessment and certification process in the UK is the Building Research Establishment Environmental Assessment Method (BREEAM), with other standards, such as the WELL Building Standard, beginning to penetrate the market. So, is BREEAM assessing the factors that matter most, and how applicable and relevant is it to all buildings? Launched in 1990, BREEAM is the industry norm in the UK and has been used to demonstrate the sustainability credentials for over half a million buildings which have been assessed and certified under the scheme. BREEAM is regularly updated to maintain its alignment with industry issues; at the time of writing, the BREEAM 2018 New Construction manual, to replace the 2014 iteration, is about to be released. What factors contribute to the BREEAM rating? Energy, health, wellbeing, transport, water use, ecology & biodiversity, materials, waste, and pollution are measured, with credits awarded under each metric, equating to an overall score which distinguishes a building in achieving its certification rating. There are assessments for all types of buildings – domestic, public, commercial and industrial – and all stages of a building’s lifecycle – new construction, fit-out, refurbishment and in-use. The BREEAM methodology also covers an international market, with BREEAM new construction and fit-out assessments being carried out in 77 countries. BREEAM comes highly recommended, with 96% of survey respondents to a 2012 BSRIA report into the industry’s perspective of BREEAM confirming they would use it again. The economic, environmental and social benefits are multifold. Vitally, it keeps a focus on carbon emissions reduction: The 2016 report ‘Assessing carbon emissions in BREEAM’ demonstrated that the average CO2 saving for a BREEAM assessed building is 22%, whilst a BREEAM Excellent building is expected to reduce carbon emissions by 33%. Other drivers include operational cost savings, improved occupant satisfaction, greater marketability and positive industry standing. It is seen as both ‘carrot’ and ‘stick’: Often the targeted level of BREEAM rating is specified as a condition of planning consent by local authorities; equally the rating is used as a ‘quality hallmark’ in organisational policy in both the commercial and public sector procurement strategies. It is important that BREEAM is seen as a ‘level playing field’ assessment when considering the costs – or investment – of achieving certification. A 2005 report, ‘Putting a price on sustainability’, calculated that the additional capital costs for an air-conditioned building to achieve a BREEAM Excellent rating could be as much as 7%. However, the 2014 ‘Delivering Sustainable Buildings, Savings and Payback’ BRE and Sweett Group report evaluated the capital cost increase for scoring an Excellent rating for an air-conditioned office at around 0.9% (in a location with ‘good’ public transport links). BREEAM has been criticised for being ‘tick box’ in its applicability, for example, how the constraints of site, such as orientation and location of a building or proximity to transport links, result in the loss of potential credits. Also, the ease of ‘achievability’ of some of the factors has changed in the context of macro-environment, for example through advances in waste recycling. The weighting of other factors continues to grow in importance, such as wellbeing. Critically, costs are more easily controlled by including BREEAM early in the design process – the earlier the better. BREEAM is updated every three or four years to maintain its relevance and flexibility, and reflect the evolution of building regulations. The BREEAM 2014 manual moved away from outdated Green Building Guides and Green Lease Agreements so that new construction shell / shell and core, and refurbishment and fit out schemes could be effectively assessed on a level playing field. Now, the proposed 2018 manual pushes forward on two key issues, the performance gap and lifecycle analysis of materials, while progressing existing issues such as sustainable transport, glare control and good air quality. One of the most important changes in the 2018 manual is the emphasis BRE has placed on addressing the energy performance gap between design and actual performance. Under BREEAM 2018, extra credits are available for detailed energy modelling including the estimated unregulated energy demand and possible verification stage of actual performance. Whilst BREEAM includes wellbeing in its scope, through design and operation, the relatively new WELL Building Standard certification focuses on achieving performance and health and wellbeing outcomes. As project teams seek to have building projects receive dual certification under both BREEAM and WELL, the two certification bodies have worked together to provide guidance to help save time and costs associated with ‘double’ certification. Published earlier this year, there is an updated document, ‘Assessing Health and Wellbeing in Buildings: Alignment between BREEAM and the WELL Building Standard’, detailing how to achieve joint certification of BREEAM and the WELL as efficiently as possible. To drive progress on a key issue, BREEAM 2018 has more focus on minimising local air quality impact. There is now a prerequisite requirement to carry out an Indoor Air Quality Plan for the development, and a credit now taking into account VOC and PM emissions from mechanical equipment for space heating and hot water by rewarding plant that is assessed in line with EU emissions labelling. BREEAM 2018 also now takes into account setting appropriate NOx emission targets based on the project location. 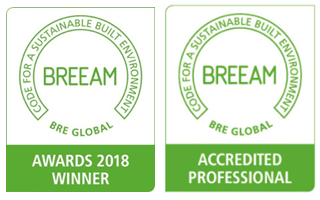 BREEAM is a widely understood, popular industry standard that bolsters its relevance at each iteration, while striving to signpost future developments and drive forward standards in sustainable building design and management. There are challenges, and we see demand for tailored approaches from some of our international clients interested in comparing their building stock across LEED, BREEAM and WELL standards as well as their own metrics. The most important lesson is the importance of starting the BREEAM process as early as possible, making achieving sustainability targets easier and cheaper than leaving it later.